We have Just Sold out of Star Wars The Force Awakens Extendable Lightsabers. Not to Worry! Fill in the Notify me When Available and you will be the first in line for our restock of Star Wars The Force Awakens Extendable Lightsabers !! From the Star Wars The Force Awakens collection by Hasbro. 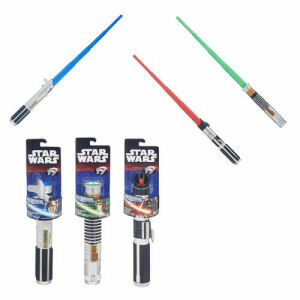 Star Wars The Force Awakens Extendable Lightsabers. This case includes 8 individually packaged lightsabers: 3 Luke Skywalker - 2 Anakin Skywalker - 3 Darth Vader. Light Sabers extend to approximately 30 inches. Ages 4 and up. Hasbro Star Wars Costumes shipping from Canada. No Surprise Border fees or Customs!